This is an exciting game which can played at many pokie rooms. Ainsworth is the developer of this gambling game and this causes a reliable machine which players can trust. To the extent you can trust a pokie, gamblers will always lose in the long run. Pokies are called one armed bandits in some regions and that’s not without reason. But on a lucky day you can win big too, but if you expect it every day then we advise a visit to a Gamblers Anonymous group. If not, we can advise safely to give Players Paradise Platinum a try some time. Play Aussie Pokies in an online casino with 1,200 AUD free real cash! You can opt for three games in one: Vegas Fortune, Vegas Fever and Vegas Fantasy. 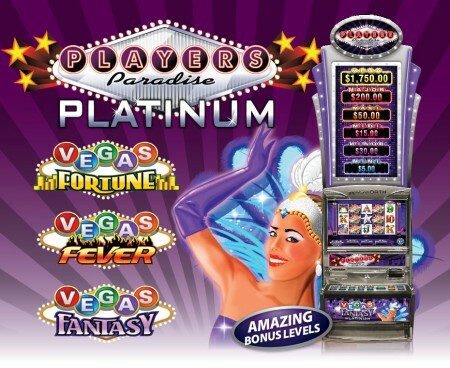 They have common features like free spins, jackpots and multiple bonus games. The way these features are triggered are distinct. In this way you don’t have to change places to a new pokie. You can stay where you are and just choose for a different game in the same machine. Player Paradise Platinum is very entertaining this way. One of the super machines to choose from. The in-pokie game option called Vegas Fever. The third option: Vegas Fortune.